Many thanks to the students of Dalriada School in Ballymoney who entered into the ‘Young Enterprise Competition’ and won ‘Best Social Enterprise’ with their ‘Don’t Put A Lid On It’’ business idea raising £200.00 along the way for AMH. Our Aim – Our business aim, as we were a social enterprise was to raise awareness of a social issue. We decided that the issue which was frequently appearing in the papers and newsfeeds recently was the hot topic of adolescent depression and anxiety. The profit that we raised would therefore be donated to a charity to benefit this cause and raise awareness; on Friday 17th April we donated all of our profits to Action Mental Health NI. Our Slogan – We based this solely around our social issue and came up; “Don’t put a lid on it”. We thought this was perfect as it raised awareness of the issues of mental illness and depression among young people; bottling up their feelings and not talking to someone. We also loved the idea as it made practical reference to our product. Our Product – We also wanted to show care for the environment and wanted to recycle a common product to give it a new function. The use of glass jars was the first idea to come to mind. We then decided on how best to decorate them, what to put in them and who would be our main target market. We priced the jars according to size and the quality and their contents, some jars contained candles, some jars were left empty and some were filled with sweets. 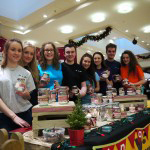 We designed the jars was a Christmas theme as we would also be entering the Yong Enterprise Competition at Ballymena Tower Centre was on the 3rd December. There we were awarded with ‘Best Social Enterprise’ and sold £240.74 of stock. We also attended various Primary School Craft Fairs including the Irish Society Primary School and Carnalridge Primary School where once again we were very successful with sales. Following our success and determination to raise as much money as possible for our charity we also paid for a pitch at the Vineyard car boot sale, an extremely early start but well worth the effort. 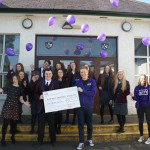 Our Team – In the company there are eleven team members who are all AS Level Business Studies students. They volunteered their skills and abilities in the subject to create and come up with an innovative idea that would be appealing to members of the public. The product that we came up with was homemade jars which we decorated and added value by making unique alternations to recycled jars, we sourced the jars from fellow pupils and teachers who very kindly donated any empty jars that they may have accumulated over time. We all applied for different roles within the business and were assigned jobs which suited our personalities and skills; Director, Marketing, IT, Operations, Secretary, Sales and Finance. Team members included Lewis Dobbin, Cait Kirkpatrick, Ruth Taggart, Sarah Crossey, Katie Pierce, Rachel Taggart, Emily Mainwaring, Andrew King, Alice Coulter, Ellen Reid and Oonagh Jordan. Our Skills – During the whole process of setting up and running the mini company we developed many useful and practice skills. Organisation, sharing ideas, dealing with conflict in the team, delegating, applying business ideas, time management and the most important and basic skill of all effective communication. We also developed our sales skills at the various events & trade fairs that we attending, negotiating with the general public. All in all this prepared us fully for the young enterprise competition where we competed against other strong mini companies from many schools. Our business idea and sales technique clearly impressed the judges as we won the award for best social enterprise. Thank you – The team would like to thank the various members of staff at Dalriada who contributed towards the start-up capital through buying share in the company. 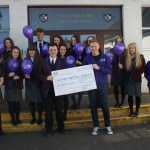 We would also like to thank the pupils & staff of Dalriada and all customers who bought our product and contributed towards fund raising for the charity Action Mental Health. Also a big thank you to Danske Bank, who assisted the business during many of their meetings. Finally, we really appreciate all Mrs Parkhill’s help, advice and guidance during the year and for all her hard work and dedication to the company. We were delight to be able to present Action Mental Health with a £200 cheque which will go towards raising awareness of mental health in primary schools in Northern Ireland. Being involved in Young Enterprise’s Company Programme has been a great experience and provided us with many opportunities.